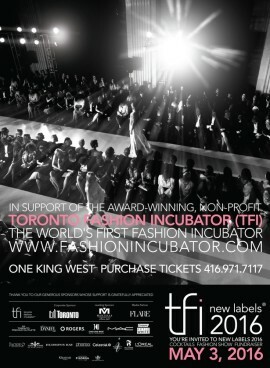 The Perth Soap Co. | Toronto Fashion Incubator: #TFINewLabels Fashion Show - The Perth Soap Co. The glamourous TFI New Labels fashion show was held by non-profit Toronto Fashion Incubator at the One King West hotel in downtown Toronto. The year’s event featured four emerging Canadian designers who competed live on the runway to win the Suzanne Rogers $25,000 award for Best New Label and a feature in FLARE magazine. The Perth Soap Co. team prepared 300 gift sets to be featured in the gift bags that were given to attendees at the #TFINewLabels event. As seen on LouLou Magazine’s Instagram, The Perth Soap Co. was lucky enough to be sitting front row at the #TfINewLabels fashion show to witness Susan Rogers present Peggy Sue with her award. We had a fantastic time at the #TFINewLabels fashion show and can’t wait to be a part of TFI’s 30th anniversary next year!